I ate food in Kharkiv and Kiev. 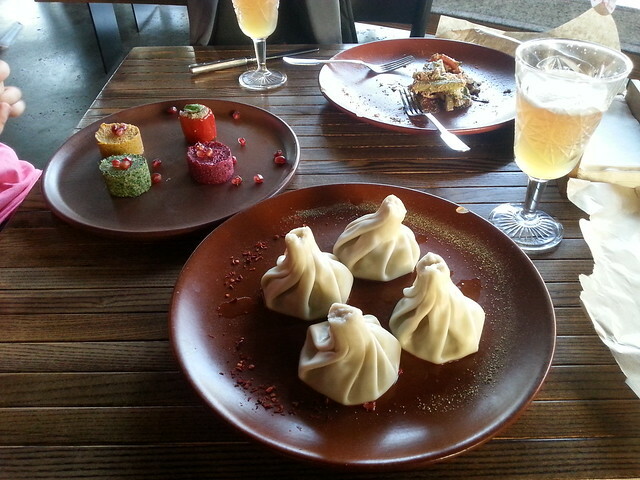 There was not much in Kharkiv, but I found a good Georgian restaurant with tasty mushroom khinkali and pkhali. The Ukrainian equivalent of khinkali are vareniki, which seem to be made with egg in the dough (at the varenik cafe, anyway). You can have a salad sandwich at Freshline, which is basically Ukraine’s Subway. 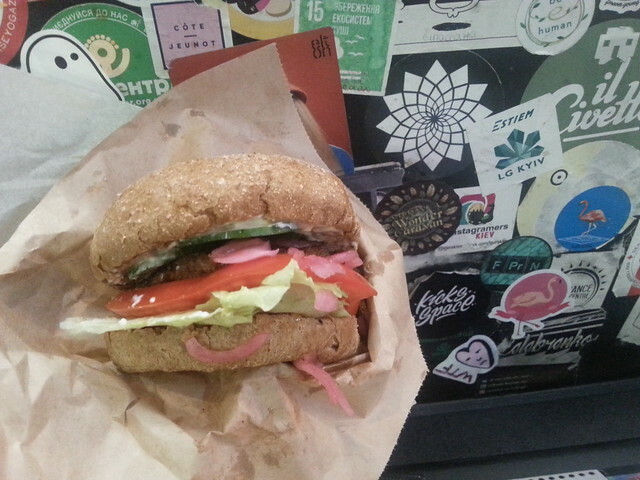 There are quite a lot of explicitly vegan places here, and they are pretty good. 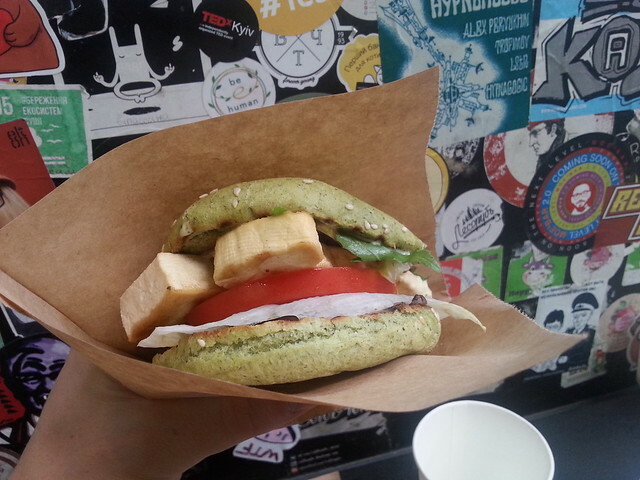 I went to Green 13 several times for burgers and soup, which were all good. I also had a tofu based cheesecake which was not bad. Burgers are about 50 UAH (1.5 EUR). I went to One Planet once. It was the first vegan restaurant in Kiev. 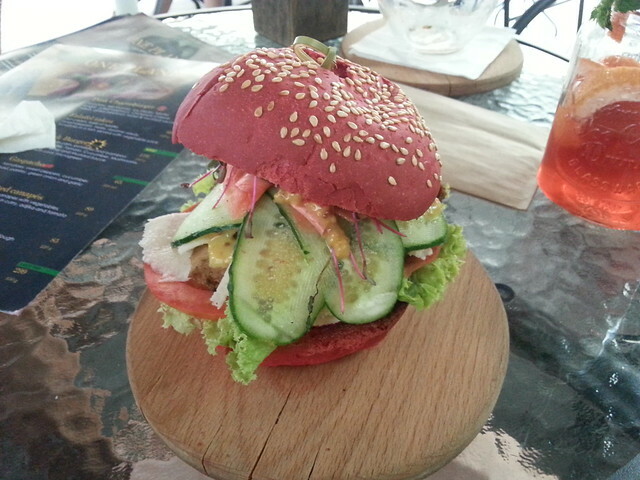 The food was quite good, but a bit small portions, and the burger bun was overdone and crunchy. 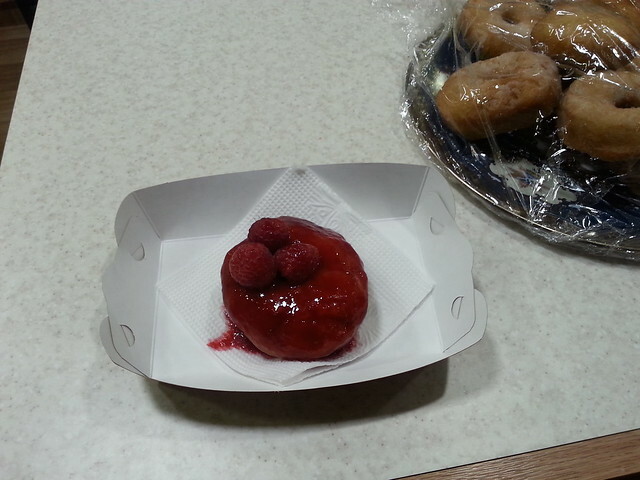 The filling was tasty though. Nebos is a bit odd. It’s all raw, which I didn’t realise at first, and all vegan except for honey. The first odd thing is the waiters with black bow ties, which doesn’t really go with paper placemats with adverts for specials on them. 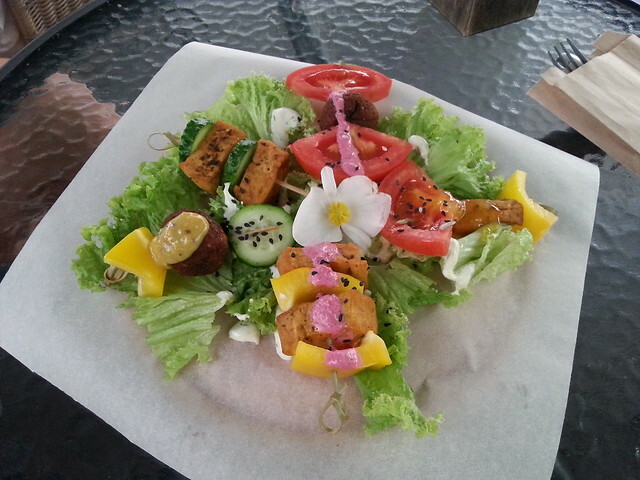 The food is a bit mixed too. For a moment I almost thought it was close to Kopps, a fine dining vegan restaurant in Berlin which I have not seen anything like anywhere else, for tastyness, if not presentation. 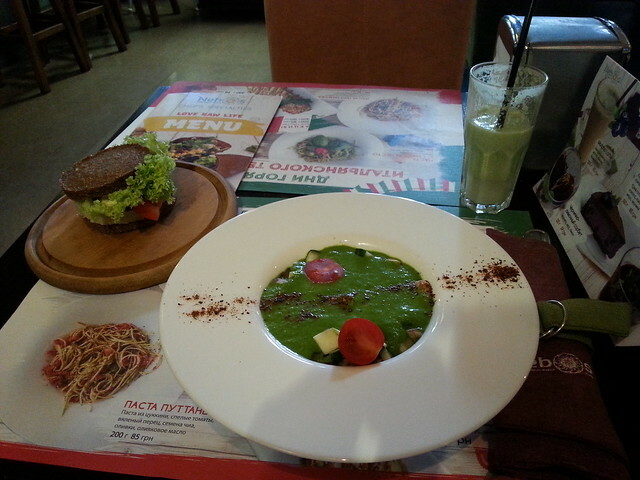 I tought this when tasting the Borsch (with avocado instead of meat), and a smoothie. Unfortunatly my main course was so bland and dry I couldn’t finish it. I actually can’t remember a time before I have not finished food in a restaurant (excluding maybe British Indian places), so it must have been really bad. It was meant to be sprouted buckwheat with tomato sauce and cashew cheese sticks. 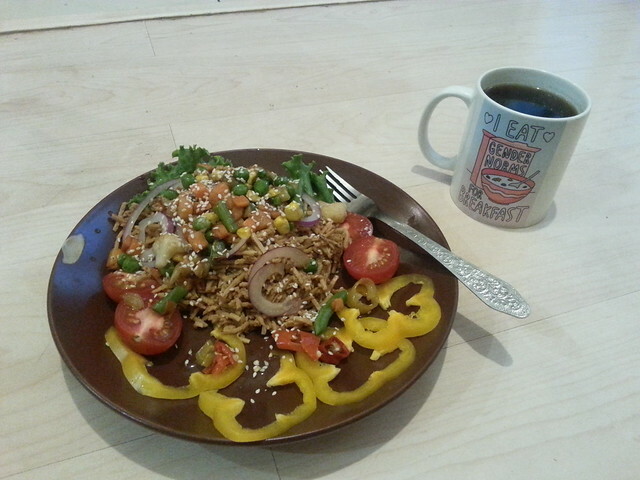 It seemed to be missing the sauce, but when I asked was told it was in the buckwheat. There was a slight reddish hint to it. 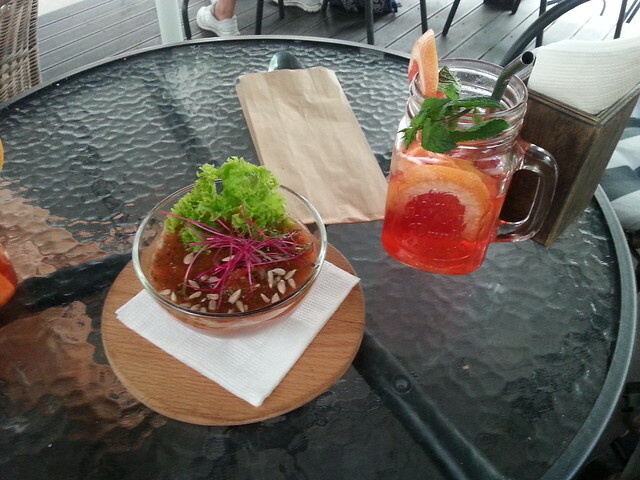 It tasted of almost nothing. The cashew cheese also tasted of very little. I would probably go to this place once to try it, avoiding the buckwheat, but I didn’t go back. It was about 1/10th the price of Kopps, too. I tried the sushi chain Sushiya once, in a shopping centre, because it’s what there was. They have two vegan items on the menu. The seaweed was ok. The roll of cucumber, I think it was, was bad. I didn’t know it was possible to make sushi bad, but somehow they did it. Also very busy and slow. Would not go again. 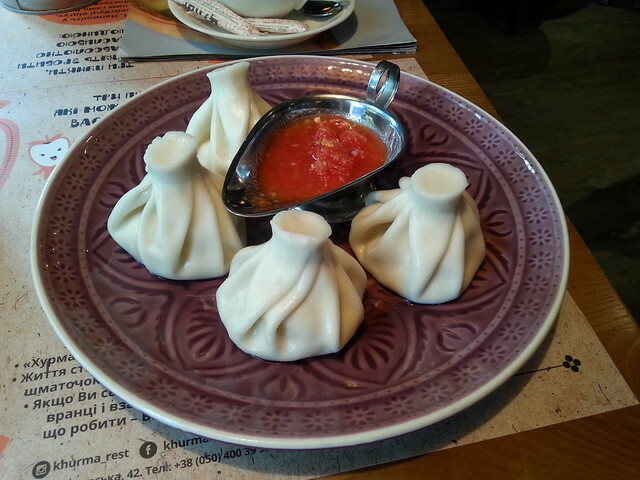 Khinkali at a Georgian place in Kiev. They had mushroom and potato. The mushroom was good, the potato a bit meh, just plain mashed potato. I like Hum:Hum. 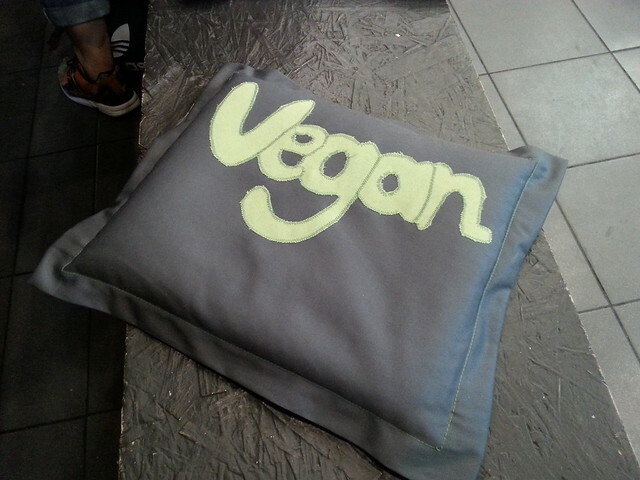 They are not a vegan place but have a fair amount of vegan stuff. It’s a cafe really. 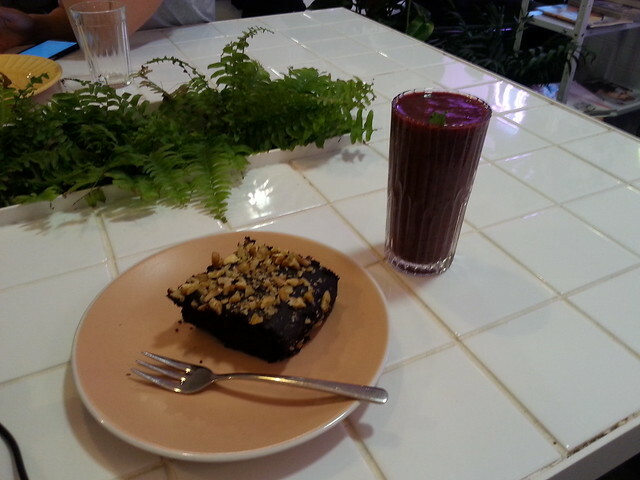 I had a fairly good brownie and something called a hummousexual smoothie. :) I went twice.